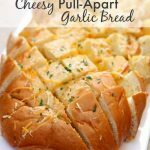 If you haven’t tried Cheesy Pull-Apart Garlic Bread before, let me warn you: garlic bread will never be the same again. This stuff is AMAZING! Line baking pan with aluminum foil. Place bread on foil. Use a bread knife to cut diagonal cuts down the top of the bread. Do not cut all the way through the bread. Stir garlic salt and minced garlic in melted butter. Drizzle garlic butter between the cracks in the bread. Stuff cheese down into the cracks of the bread. Wrap in aluminum foil and bake for 15 minutes. Unwrap foil and bake for an additional 5 minutes.